A previous tutorial explained how to export your Favorites from Internet Explorer; while you can use that technique to backup your Favorites, it will save them inside an HTML file, not as a backup folder. This tutorial explained how to easily backup your entire Favorites folder on your desktop, to CD, or external drive (USB or otherwise). Then, type "favorites" inside the Open text box, and hit Enter (or click OK). 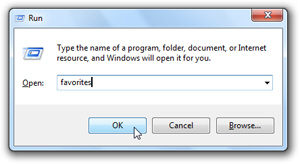 Windows will open your Favorites folder in Windows Explorer, ready for backup: hit the Backspace key to go up one level, and you will see the Favorites folder automatically selected, inside your Windows profile folder (whose exact location depends on your version of Windows). All you need to do now to complete your Favorites backup is to find the location where you want to create (paste) a copy of your Favorites. 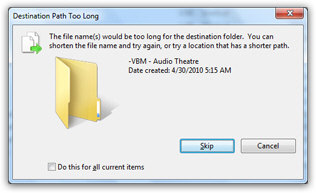 This can be another folder on your computer, or (ideally) a remote storage or another computer. Using a different computer or location for your backup is ideal, in case your main computer crashes. To rename a Favorite whose name is too long, highlight it and press F2 - universal Windows keyboard shortcut to rename files and folders!